La Réserve is an installation inspired by the specific history of a park that the city of Montreal left without any designation. 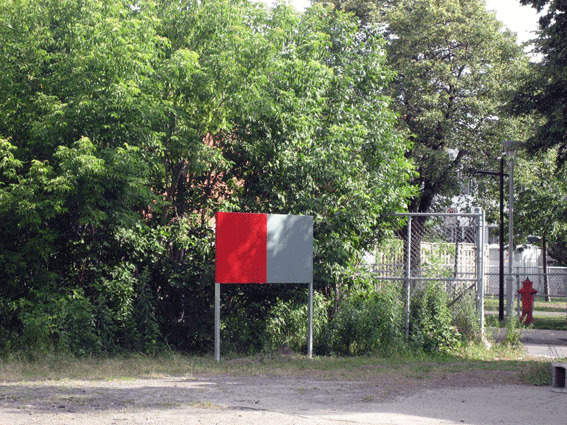 At the park's entrance, a structure evokes the two squares - one red, the other, grey - usually used by the city of Montreal to announce the park's equipment. A mobile and transparent suitcase completes the installation. 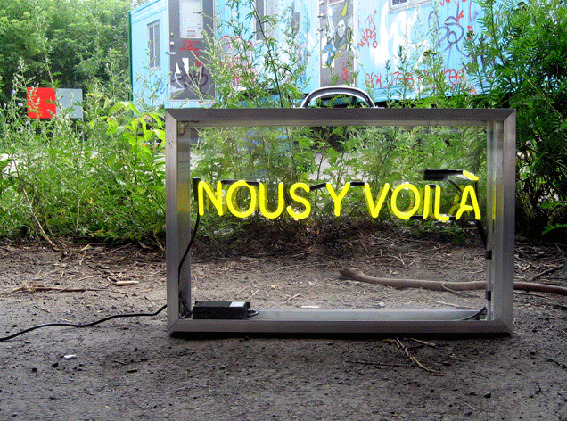 A neon sign shines within the suitcase, stating that a journey has come to an end: "Nous y voilà" ("Here we are"). Place without a name, determines its own context. La Réserve is an installation by Clément de Gaulejac who was inspired by the specific history of a park that had been left without designation or assignment by the city of Montreal. Not knowing what to do with the space, the city decided... not to make any decision about it. And so, the park was left as it was, a white space on the map of the city. A fence prohibiting access to the park insured that the default decision would not be countermanded by use of the space. DARE-DARE moved into the park in 2006, opening the fence, and printed business cards with the intriguing mention "located in a park with no name". Clément de Gaulejac decided to leave his own mark on the story of this park by imagining an installation by which this unnamed park became The Park With No Name.